This compact breed of dog is characterized by a flat face and naturally occurring “bat ears” that are wide at the base and rounded at the top. Frenchies were originated in England but got their name in France as French Bulldogs because they were largely taken by lace makers shifted in France during the end of Industrial Revolution. French Bulldogs are bred from Bulldogs and Terriers and therefore canine aggression can sometimes occur. They are related to the English bulldog and American bulldog. The weight of French Bulldogs can range from 22 – 28 pounds. The height ranges from 11 – 13 inches, up to the shoulder. The coat is normally short, smooth, close and finely textured and comes in a range of colors including brindle, pied or fawn. The names of dog breeds are separated into different dog types which are referred to as Dog Groups. The name of the dog group for French Bulldogs is the Non-Sporting dog breed. French Bulldogs were registered by the AKC (American Kennel Club) in 1898. Breeding French Bulldogs for appearance was only introduced in the 19th Century. The average cost of owning a medium sized dog over a 10 year period is estimated at over $13,000! This provides a good idea of how much it costs to raise French Bulldogs. French Bulldogs are one of the most expensive dog breed to buy and also to keep. They are mischievous and like to play. The naughtiness in their nature never goes by age. French Bulldogs likes to eat a lot. They won’t like anyone around them while eating. They also tend to sleep too much! They can be good watch dogs but not guard dogs French Bulldogs are not fond of water at all. Actually they hate going near it. Most French Bulldogs can’t swim because of their small legs and large heads. There is no such thing as “rare” colours in the French Bulldog. If a Frenchies coat colour is anything other than the colours given in the Breed Standard then it is not rrecognized as typical. 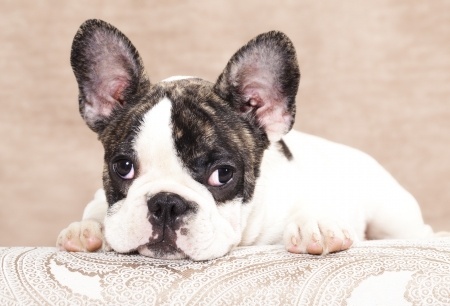 If a Frenchie is not trained well he can be hard headed and stubborn, they can get gassy, easily tired and overheated. They snore when asleep, and have tendency to drool. They are also known for having a number of health concerns. That’s why they can be quite costly and would tend to require more than normal visitations to a vet They bark only when they have something to tell you and that includes having an intruder in your home. French bulldogs also have a good temper and are generally well behaved.